Shoulder pain is a very common problem for peoples who work for a long time sitting at desk. This problems is temporary and can be cured within 2 weeks with some light stretching and exercises. Even if does not work you can take pain killers and also use ice packs for much relief. Stand straight and raise your shoulder, hold for 5 seconds. Now come to relax position and then squeeze back both your shoulder blades and hold for 5 seconds and now pull your shoulder blades downward and hold for 5 seconds. Take some rest and repeat the exercise 10 times. Firstly stand straight in a doorway, place your both arms on the wall slightly above your head and lean forward for 15-30 seconds, until you feel a stretch in the front of your shoulder. Repeat this exercise for 3 times daily. Stand with one hand, resting on a chair, keeping the other arm free. Now start swinging the free arm gently forward and backward direction in circular motion. Try to repeat for 5 times alternatively for both the arms. 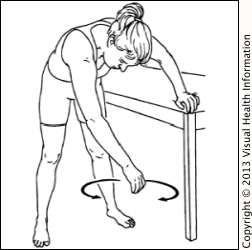 Stand straight in a doorway with your one elbow bent at right angle and the back of your wrist against the door frame and push your arm outwards against the door frame. Hold for 5 seconds. Repeat the exercise 3 sets of 10 reps for both the arms alternatively.